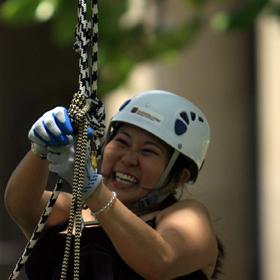 UPWARD BOUND » Kaimuki resident Jamie Drasal laughed while securing her climbing rope Saturday during the International Society of Arboriculture's International Tree Climbing Championship. A feud over feral pigs has a neighbor feeding and another eating. Tighter controls on fireworks and forcing landowners to keep their property from turning into tinder are among the proposals. A new doctor's office offers spa treatments -- and medicine, too. Arborists are serious scientists, but their sylvan passion stems from their general love of trees. Another year, another triumph for Jamie Mitchell in the Quiksilveredition Molokai to Oahu Paddleboard Race. Vernon Pico and his crew "ride the ditch" to keep the Waiahole Irrigation System free of obstructions. The Navy has issued a draft EIS concerning testing and training in Hawaiian waters.